Husker Harvest Days is located in Grand Island, Nebraska and is the Midwest’s largest totally irrigated working farm show. 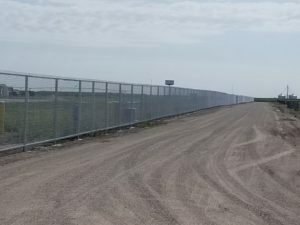 Year after year American Fence Company of Grand Island installs 7,000+ feet of chain link temporary fence, gate operators and access controls to ensure the safety and security of its thousands of attendants. The Nebraska State Fair is another large project that American Fence Company of Grand Island installs rental fence for every year. In 2008, the Nebraska State Fair moved from Lincoln to Grand Island. For the ten years since it has put itself in American Fence Company’s capable hands for all of its pedestrian barricades and rental fencing. With acres of inventory and several installers at the ready, American Fence Company of Grand Island is the best company to do a fast-paced, high quality job. The Nebraska State Fair may seem like an intimidating job with over 5,000 feet of chain link rental fence and thousands of feet of windscreen. However, American Fence Company of Grand Island has more than the ability and resources needed to get this project up and ready quickly. Whether a project is high caliber like the Nebraska State Fair or Husker Harvest Days or if it’s something basic like replacing some posts or pickets on a vinyl fence, American Fence Company of Grand Island is the number one choice to get the job done. American Fence is proud to serve Norfolk, Kearney, Columbus, North Platte, Grand Island, Western Kansas, and all other communities in the area. To get your free quotes or with help with any questions or concern, please visit the American Fence Company of Grand Island website today.